Even though this blog is about researching personal finance topics, sometimes I get caught up in other research projects that have nothing to do with finance. 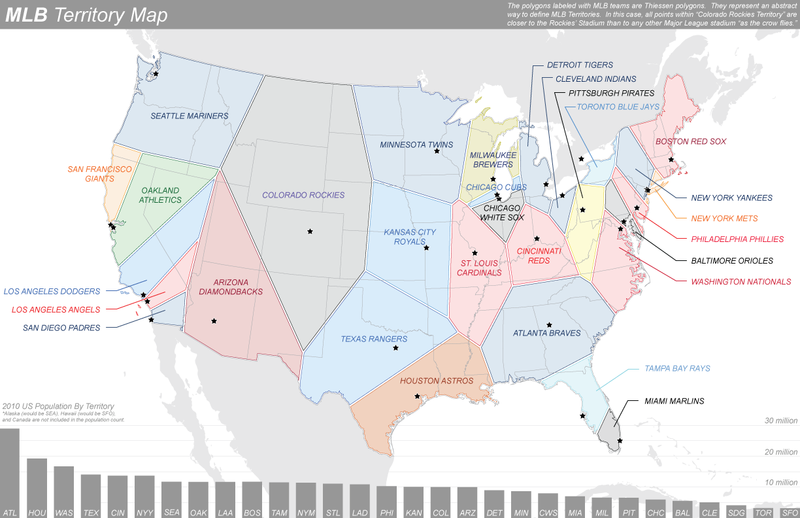 About a year ago, I became obsessed with the idea of trying to divide the United States into Major League Baseball territories. The idea was that you should root for whichever team that has the closest stadium to you (as the crow flies). So without further introduction, here is the map. Hopefully this can help you answer the questions, “Which Major League Baseball team should I root for?” or “Which Major League Baseball Team is closest to me?” I’m also happy to answer any questions about the methodology – just leave a comment! Also check out Part 2 of my research project, focusing on the Mid Atlantic region (Orioles and Nationals Territory) with a little more detail and new information. *UPDATE* After the map made its way on Twitter, a few sharp folks noticed that the some of the territory boundary lines were a little off. It turns out the computer algorithm I used had some bugs. Obviously I should have checked this by hand, but I guess that’s what you get when you trust the computer too much! My apologies. For those of you interested in the mapping process, I included a description of the changes below the revised map. Description of Changes: The original boundary lines were produced by running a computer program within a geographic information system software that generates “Thiessen Polygons.” Without this program, it is extremely time consuming to draw the polygons by hand – especially for a side project. The mistake I made was assuming that the polygons drawn by the computer were correct, and not double checking by hand. For this revision you see above, I calculated the Thiessen polygons myself using this process (in PDF). I’ve checked and rechecked the distances this time, and I’d say the accuracy is +/- 1,000 meters. I’ve also updated the population figures. I had some good comments wondering if the the original errors were due to the the projection. Just FYI – I used a Albers equal-area conic projection, which preserves polygon areas but has some minimal shape/straight line distortion. As always let me know if you have questions.